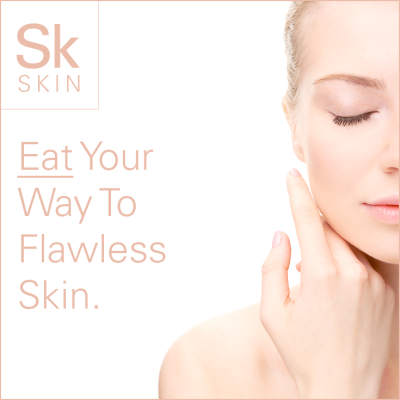 Eat Your Way To Flawless Skin. Forget about the perfect blowout, mastering the art of a winged eye, or finding that killer outfit. Nothing you do can look as good as getting a glow that radiates from the inside out. You know the one I’m talking about. It’s youthful and natural, pulling people in like a magnet. I have battled everything from dry skin to blemishes, especially during that certain time of month. What finally worked for me and gave me the skin I dreamed of was not a peptide-poly-something-or-other, it was food. The nutrients in food are what actually repairs and rejuvenates your skin cells. If you aren’t eating the right amount of nutrients for your body, your skin is going to tell you and the rest of the world. Eating to restore your natural beauty from the inside out is actually easy and delicious. And the best part is, all the foods you need for glowing skin are also the foods you need for a strong and healthy body. Beautiful food. Delicious skin. Slender side effects. If there were a ‘natural’ prescription for the skin, it would be dark leafy greens. They contain all the essential beauty nutrients to replenish your skin, hydrate your cells, and give you an envious GLOW. Most dark leafy greens are rich in collagen-producing vitamin C and beta-carotene, which are essential for restoring the elasticity of the skin and repairing damage to skin cells. Aim to eat 6-8 servings of dark leafy greens daily to help detox your skin and remove impurities that are caused by a build up of toxins in your body over time. Fat does not make you fat. Essential fatty acids, like omegas, are the building blocks of healthy cell membranes and help keep the skin hydrated, plump, and radiant. Nuts are rich in vitamin E and selenium that help the body prevent breakouts and fight free radicals. Without these nutrients your skin will become dry and inflamed resulting in pimples. I’m sure you’ve heard stories of how your grandmother healed using nature’s pharmacy at some point or other. My own grandmother swore by clay poultices for sprains and a concoction of lemon and raw honey for sore throats. And those remedies actually worked. Herbs are a key staple in the ultimate beauty regimen and can be used to heal specific skin conditions. They are loaded with beautifying vitamins, minerals, and fatty acids that will help rid your skin of harmful bacteria and provide the nourishment your skin needs. Add herbs to your morning smoothie or to a fresh brewed tea for the perfect ‘beauty elixir’. Your skin needs hydration in order to glow. While there’s nothing wrong with spreading your favorite nut butter on top of a Ryvita cracker, that meal will not do much for your skin. Even with the good fats in there, your skin needs water to be radiant. Actual water goes through your system and detoxes your body but eating water packed veggies actually hydrates your SKIN. Take beets for example: they contain 75% water and are loaded with phytoceramides, lipids from plants that help prevent wrinkles and sagging of the skin by nourishing the cellular walls. Here’s some food for thought: Think about the difference between a grape and raisin. The grape is nice and plump with radiant skin while the raisin is wrinkled and old looking – what’s the difference? Water. 2 Responses to Eat Your Way To Flawless Skin. I just finished reading this page. It was very helpful; i’ve been suffering from bad skin for many years.. Now I see why…bad choices of foods and picking on my scabs have left black marks along my left side. It really bothers me while engaging with others on a day to day basis. I tend to pick a lot while thinking. Now, I will these food choices to make a difference in the appearance of my skin. I’m really happy you’ve found the content helpful, Bina. The good news is, you really can start improving the appearance of your skin with your very next meal by eating the purest, cleanest, most nutrient-dense foods that are as close to nature as possible. Over time, you’ll see beautiful results. Thank you for taking the time to leave me a comment. I appreciate you much!